perhaps to your next meeting! to make an entertaining presentation to your group. Our demonstration group usually consists of three Redcoats, occasionally more. then proceed with a talk and demonstration. but a typical talk could encompass different subjects. Brief history of the Revolutionary War and the key part that the First Foot Guards played in it. Description of the glorious campaigns from the 1600s to the Napoleonic Wars in which the First Foot Guards won battle honors and kept up a proud tradition, taking us to the present period when you're likely to see The Grenadier Guards on guard at Buckingham Palace in London. Military tactics: why the Crown Forces wore red uniforms and announced their presence with drums. The roles of the battalion, the grenadiers and the light infantry. Description of what the re-enactment group does, the battles we participate in, and what it means to us. Discussion of the Redcoats' uniforms. Discussion of the Short Land Pattern smoothbore musket 'The Brown Bess' and its 17" bayonet. Our Serjeant will put the men through their paces. 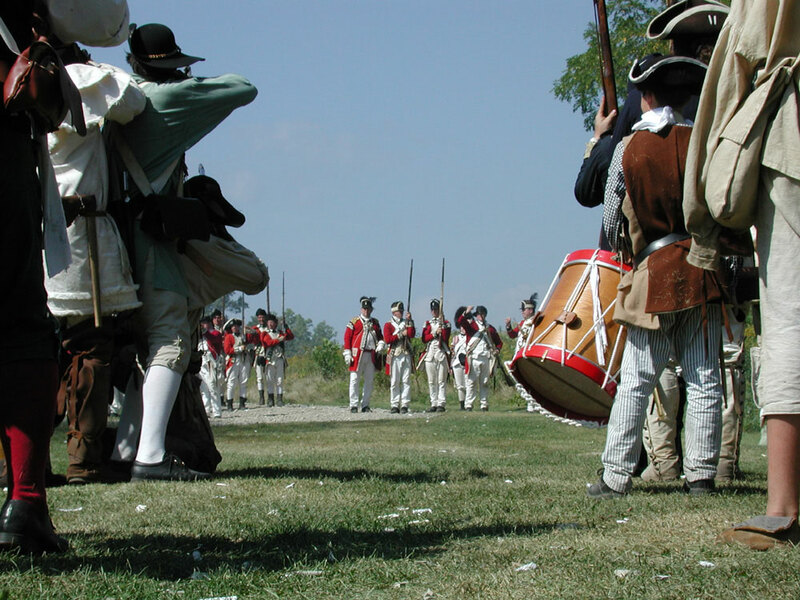 See the precision drill of the men, watch as they fix bayonets and prepare to charge, exactly as was done on Lexington Green in 1775, or set up for their 'street fighting' maneuvers. The Redcoats were the formidable fighting force of the age. Everyone wants to know more, and a lively session always ensues. The audience gets to see how the Brown Bess functions, and to ask one-on-one questions. It's always wise to leave 15 minutes for this part of the presentation. We're usually still answering questions after the meeting has formally closed! The First Foot Guards is a member of the British Brigade which has stringent safety requirements. All of our members are trained in safety issues. Since our meetings are indoors, we do not fire our muskets, nor do we bring any explosives into the buildings. The First Foot Guards make presentations as part of our outreach to keep people informed of historical issues in the Revolutionary War. We are always looking for 'a few good men' to join our select group, and talking to groups improves our visibility in our community, and occasionally gleans a recruit. We do not require a fee for service, but since The Guards is a registered non-profit group, we welcome your donation.